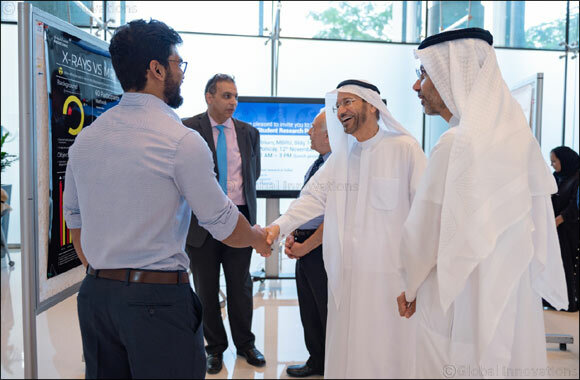 Dubai, UAE, December 20, 2018: Medical students from Mohammed Bin Rashid University of Medicine and Health Sciences (MBRU) presented their thought-provoking research projects at the annual MBRU Medical Student Research Day, held at MBRU campus in Dubai Healthcare City. The conference gave 49 third year medical students a platform to display their engaging work across four main strands: biomedical, clinical, public health, and medical education research. The work, a key component of the six-year Bachelor of Medicine Bachelor of Surgery (MBBS) degree program, was supervised by research mentors from MBRU as well as Al Jalila Children’s Specialty Hospital (AJCH) and Mediclinic City Hospital, both clinical academic affiliates of MBRU. “There is a strong emphasis in our curriculum on critical thinking and applications of the scientific method. Over the course of structured modules that span 5 semesters, our students are introduced to the disciplines of statistics, epidemiology and research methodology. This journey culminates in a research project lead by the student and supervised by our faculty. We hope that in doing so, we will graduate doctors who are life-long learners and evidence-based scholars. Not only will they be critical consumers of knowledge, but we hope they will also contribute to the generation of new knowledge.” said Professor Alawi Alsheikh-Ali, Dean of College of Medicine at MBRU. Public Health projects displayed at the conference included research into vitamin D deficiency, body image, eating disorders, and sleeping patterns. Al Moosa conducted research among 72 MBRU students to determine whether increased Body Mass Index (BMI) is related to sleep disturbance and quality, and to study the prevalence of obesity among the MBRU student population. “One of the key findings of my study was that there was a direct association between the person’s BMI and number of time he/she wakes up in the night to go to the bathroom.” he explained. AAfia Gheewale, presented her clinical research work titled: ‘Can we trust them? Correlation of cervical smears with subsequent colposcopy and biopsy findings at Mediclinic Hospital, Dubai’. Gheewale looked at the specificity and sensitivity of cervical smears compared with colposcopy and biopsy, concluding from her research at Mediclinic Hospital, Dubai, that the sensitivity, specificity and positive and negative predictive values of both cytology and colposcopy indicate that they shouldn’t be the sole source used for diagnosis; rather the biopsy should. Hessa Al Mansoori, conducted her research on congenital heart disease, addressing the ‘Association of congenital heart disease with risk factors’. Hessa’s results were based on 177 cases and 211 controls in which the association between risk factors and CHD were found. The studies were conducted from patients who had visited Al Jalila Cardiology Clinic between January and May 2018. Other research projects showcased including biomedical research work investigating the genetic variants of autism spectrum disorder and the prevalence of mosquito-borne viruses in the UAE.